There is a Twitter-bot that randomly tweets out “NOOOOOOOO Cassini can’t be ending!” (with varying amounts of “O’s”). @CassiniNooo represents the collective sigh of sadness and consternation felt by those of us who can’t believe the the historic and extensive Cassini mission will be over in just a matter of months. And next week is the beginning of the end for Cassini. On November 30, Cassini will begin a phase of the mission that the science team calls “Cassini’s Ring-Grazing Orbits,” as the spacecraft will start skimming past the outer edge of the rings, coming within – at times — 4,850 miles (7,800 kilometers) of the rings. Between November 30, 2016 and April 22, 2017 Cassini will circle high over and under the poles of Saturn, diving every seven days for a total of 20 times through the unexplored region at the outer edge of the main rings. During the close passes, Cassini’s instruments will attempt to directly sample the icy ring particles and molecules of faint gases that are found close to the rings. Cassini will also capture some of the best high-resolution images of the rings, and garner the best views ever of the small moons Atlas, Pan, Daphnis and Pandora, which orbit near the rings’ outer edges. During the first two ring-grazing orbits, the spacecraft will pass directly through an extremely faint ring produced by tiny meteors striking the two small moons Janus and Epimetheus. Later ring crossings in March and April will send the spacecraft through the dusty outer reaches of the F ring. “Even though we’re flying closer to the F ring than we ever have, … there’s very little concern over dust hazard at that range,” said Earl Maize, Cassini project manager at JPL. Of course, the ultimate ‘endgame’ is that Cassini will plunge into Saturn with its “Grand Finale,” ending the mission on September 15, 2017. Since Cassini is running out of fuel, destroying the spacecraft is necessary to ensure “planetary protection,” making sure any potential microbes from Earth that may still be attached to the spacecraft don’t contaminate any of Saturn’s potentially habitable moons. To prepare for the Grand Finale, Cassini engineers have been slowly adjusting the spacecraft’s orbit since January of this year, doing maneuvers and burns of the engine to bring Cassini into the right orbit so that it can ultimately dive repeatedly through the narrow gap between Saturn and its rings, before making its mission-ending plunge. During some of those final orbits, Cassini will pass as close as 1,012 miles (1,628 kilometers) above the cloudtops of Saturn. One question for Cassini’s engineering team is how much fuel is actually left in the tank for Cassini’s main engines, which do the majority of the work for orbit adjustments. Each time they’ve used the main engines this past year, the team has held their breath, hoping there is enough fuel. One final burn of the main engine remains, on December 4. This maneuver is important for fine-tuning the orbit and setting the correct course to enable the remainder of the mission, said Maize. “This will be the 183rd and last currently planned firing of our main engine,” he said. “Although we could still decide to use the engine again, the plan is to complete the remaining maneuvers using thrusters,” said Maize. When I visited with Maize and Spilker earlier this year, Spilker wistfully said that they had begun to experience some of the “lasts” of the mission — the final flyby of Enceladus and other moons. And there’s one big “last” coming up: on Nov. 29, 2016, Cassini will come within 6,800 miles (11,000 km) of Titan, the final flyby of this eerily Earthlike but yet totally alien moon. This final flyby, named Flyby T-125 has two primary goals: Mapmaking of Titan’s surface, and enabling the change in Cassini’s orbit to begin the end of the mission. But it also might be the most daring and thrilling part of Cassini’s nearly 20-year mission. 20 years of awesome. Robotic missions: 1/10 the cost and 10 times the science. 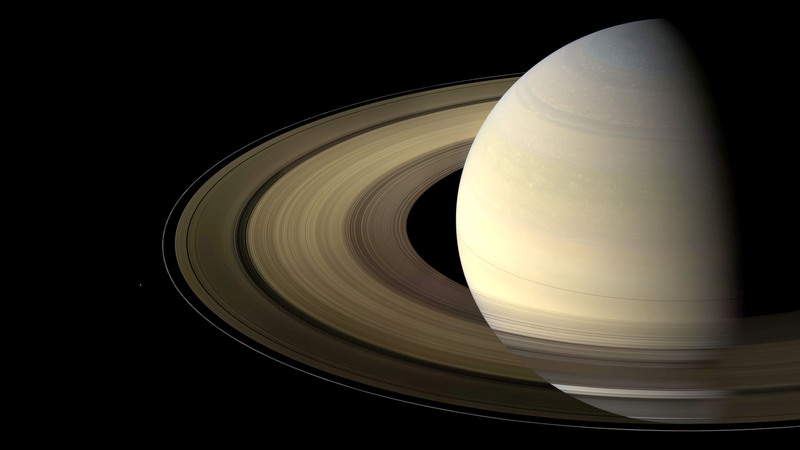 Sad to see this mission come to an end, not only fantastic science but stunning images, it has made Saturn into the No. 1 tourist destination in the solar system, would be nice to get some real close-ups of the rings. Some one has to say it! So Long Friend. Lots of good times. Next PostNext Is There Life on Mars?